Evolve Housing and Women’s Community Shelters (WCS) have launched a pilot program called Safe Foundations which will provide medium to long term housing and positive social outcomes for women and children escaping domestic and/or family violence. Safe Foundations aims to provide women and their children with an opportunity to stabilise their lives while being supported and feel safe whilst exiting from crisis accommodation; engage in employment and/or training opportunities while receiving subsidised rental accommodation; and exit into private rental marketing with a view to be living independently within three years. 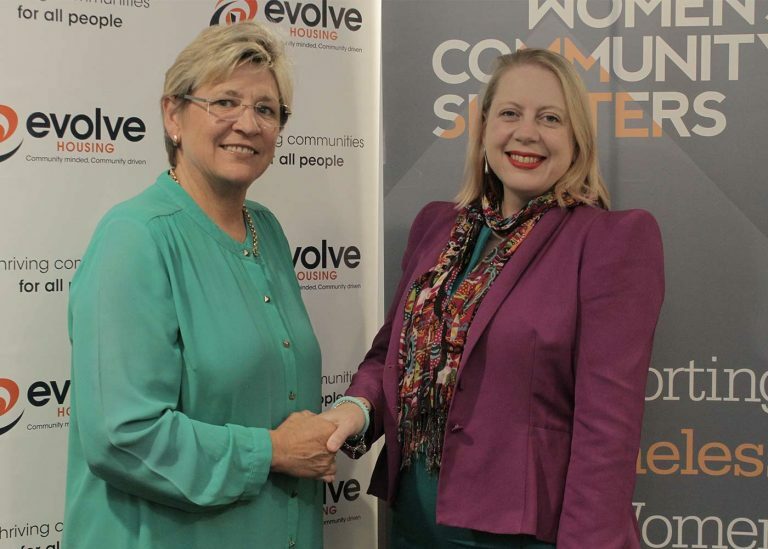 Andrea Galloway, CEO Evolve Housing said that as a Community Housing Provider Evolve recognises its responsibility to play a role in increasing the supply of for purpose social and affordable housing. With domestic and family violence a growing and major issue in our communities it is vital we provide safe and secure housing options for women and families to support them on their journey to independence. “Each night 50,000 women experience homelessness, with domestic and family violence noted as the largest contributor for women to this issue. With the high costs of housing in Sydney and particularly rental unaffordability growing, women and families who are already in a vulnerable place are being locked out of the housing market. Without providing transitional housing support many women will be faced with the reality of homelessness and become trapped in the cycle of disadvantage,” said Ms Galloway. Annabelle Daniel, CEO Women’s Community Shelters said this new and innovative partnership between is a great and practical example of how community organisations can work together to develop affordable housing options and assist women and children transitioning from our crisis accommodation shelters. “Sadly there’s a lack of affordable housing for women exiting WCS Shelters, particularly those not entitled to mainstream housing supports or private rental products More affordable housing is needed to help re-establish women’s lives post violence and homelessness and this innovative project offers immediate and comprehensive shelter services to women and children at risk of homelessness after transitioning from crisis accommodation. Consequently women are often forced to remain homeless or even return to perpetrators due to a lack of alternative accommodation options,” said Ms Daniel. Under the Safe Foundations project women and children experiencing homelessness will enjoy stable housing and support services, for up to 3 years where they can develop skills necessary to sustain their housing independently. Women’s Community Shelters will provide ongoing case management and support services to women in the transitional housing through its outreach program, while Evolve Housing will provide all housing and tenancy management services. The pilot project will operate in the Penrith and Blacktown Local Government Areas and if successful will look to expand across Sydney, providing more safe havens for women escaping domestic and family violence. Evolve Housing is one of the largest Community Housing Providers (CHP) in Australia. We provide housing assistance to eligible people on low incomes or who are unable to access appropriate housing in the private market. This includes social housing, affordable housing and supported housing. Evolve Housing manages approximately 3020 properties located across 26 local government areas in NSW with 60% located in the high need area of Western Sydney where the waiting time for social housing is 10+ years. Our asset development plan is aimed at continuing to grow housing supply with a particular focus being on high population growth areas such as metropolitan Sydney. At Evolve Housing we fundamentally believe it’s everyone’s right to a home, somewhere they can feel safe, secure and engage with the community. Women’s Community Shelters (WCS), is an Australian charity and non-profit which, in partnership with local communities, establishes and operates short term crisis accommodation for women and children escaping domestic violence and homelessness. WCS operates under an innovative ground-breaking funding model involving collaboration between business people, philanthropic foundations, local communities and Government. We operate a social franchise model that provides a pathway for communities to take local action against homelessness and domestic and family violence. With a current network of 4 shelters across NSW (Manly; Great Lakes, Hornsby and The Hills district), our vision is to expand our network to at least 8 shelters by 2018, linked together by the WCS professional services and support hub and effective technology.